I rarely eat oatmeal but recently several people told me how great it is. One of my neighbors told me she prefers the Irish Oatmeal (steel cut) imported from Ireland in a tin. I saw it at the market one day and bought it. That was a few months ago and the tin has been sitting on my shelf since. Finally I am inspired to make a savory dish for lunch since I had roasted bell peppers and cooked lobster meat. I normally prefer eating savory dishes over sweet ones. When I told my husband that I was going to make a savory oatmeal dish even he thought it was strange. This came from a man who ate roasted insects and grilled chicken butts in Thailand! After he ate this savory oatmeal dish he did commented that it was tasty and did not expect oatmeal to taste this way. 1) Heat a medium size pan with oil over medium high heat. 2) Once the pan is hot add garlic and scallions, saute for about 1 minute. 3) Add bell peppers and seaweed, saute about 2 minutes. 4) Add lobster meat, truffle sauce, and salt, saute about 2 minutes. Follow instructions on the container for cooking method. I used 1 cup of oatmeal to 4 cups of water. Once you have added the oatmeal to the water, add 1 cube of chicken bullion and 2 bay leaves. Add a few large spoonful of the Maine Lobster and Roasted Peppers over the the Oatmeal. Garnish with salted seaweed snack. 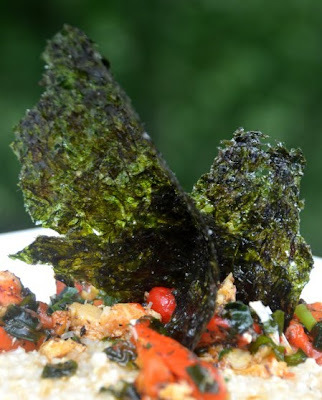 *After adding the sauce over my cooked oatmeal I broke a few pieces of the salted seaweed snack and used them as a garnish. It made the dish looks more interesting and added some extra flavor. *The cooked oatmeal dish in this recipe reminded me a little of eating risotto.